A joint project between Otter-Barry Books and arts and literary organisation Pop-Up, this sparkling anthology features the work of five talented young poets. 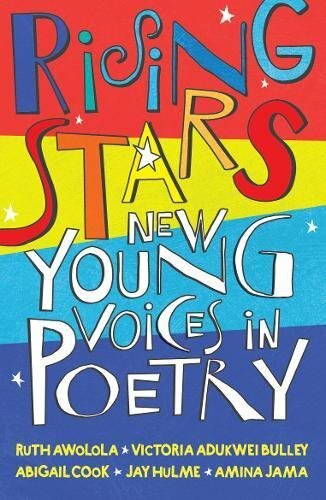 Each has a distinctive voice, and every one of the poems in this collection will catch the imagination of young people; bringing them together in an anthology gives the poems even more impact and emphasises the unique power of poetry for young people as a means to share ideas, thoughts and feelings. Ruth Awolola’s poems open the collection. At the time of publication she is just nineteen years old, but there’s already a maturity to her writing. In poems such as Mainly About Aliens and On Forgetting That I Am a Tree she contemplates finding a place in the world, while Superpowers and the memorable Pockets have the sense of being inspired by real people. Victoria Adukwei Bulley’s section opens with a poem to Lucille Clifton, ‘a patron saint of black girls anywhere/ a healer of history with soft words’, and the acknowledgement in it that ‘Any poet’s pen is heavy, some say/it takes two hands to hold one.’ In poems that use a variety of different forms she wields the heavy pen with real skill and sensitivity, writing about experiences both personal and universal. Abigail Cook’s poems come very much from her own self, from My Body, beginning ‘My body is the garden I grew up in’ to Summer Day in which ‘We sat outside in our pyjamas/ whilst the world ended.’ They’ll speak powerfully and directly to their audience. Performance poet Jay Hulme occasionally uses rhyme, the only one of the five to do so, and there’s a sense of playfulness to his poems, though always an edge too: the poem Peas will be excellent for class discussion. Amina Jama closes the collection and her poems, dreamy, intimate and lyrical, will leave readers thinking, wanting more. The collection is illustrated by three young students in their final year at Birmingham City University’s illustration course, and the whole project is a celebration of new talent, rising stars indeed. It’s exciting to read, will be exciting to share. Congratulations to all those involved in its creation.